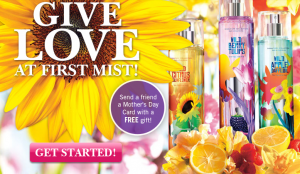 Send your mother or best friend a free Mother’s Day gift from Bath and Body Works. All you have to do is "like" Bath and Body Works online to get this free Bath and Body Works offer. The offer is good for a Mother’s Day card with a coupon for a FREE Signature Collection Travel Size Item inside. A very special thank you to Frugality is Free for sharing this great Bath and Body Works freebie! that's great! thanks for sharing! !